Balloons released in April 2013 in support of the peace negotiations, now entering the third year, between the government and the FARC. Pablo Medina Uribe & Julián Camilo García/Demotix. All rights reserved. For the first time in a half-century-long conflict, the Revolutionary Armed Forces of Colombia (FARC) agreed on 20 December 2014 to a unilateral and indefinite ceasefire. 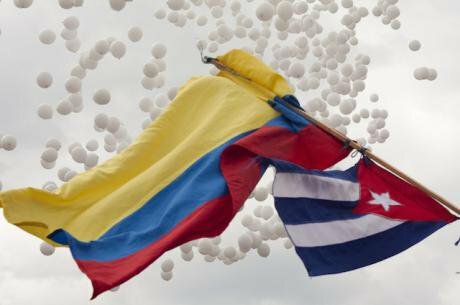 The decision marks a turning point in the on-going peace talks in Havana between the government of Juan Manuel Santos and the guerrilla leaders since August 2012. Not only is the step unprecedented but it also came just three weeks after the end of a crisis which had endangered the whole peace process. On 16 November, the FARC kidnapped a senior military figure in the armed forces, Rubén Darío Alzate, in a small municipality in the Chocó department. The event forced President Santos to halt the negotiations, only to resume them following the release of the general two weeks later. To some extent, the ceasefire highlights a transformation in the guerrillas’ tactics, paving the way for a significant reduction of violence between the two sides. According to analysis conducted by CERAC, the FARC have not committed a single violation of the ceasefire despite continued operations by Colombia’s armed forces . A month on, violence associated with the conflict has plummeted to levels not seen since the mid-1980s. But optimism should be carefully qualified. The ceasefire is conditional, dependent on measures that the FARC has sought from the government, including oversight of the deal by national and international bodies. It has also warned that, should government armed forces attack, the ceasefire will be dropped. The government welcomed the announcement, claiming that it could indeed lead to a permanent peace. But Santos reinforced the state’s duty to ‘protect’ the Colombian people and deferred discussions on a bilateral ceasefire until further rounds of negotiations in Cuba. This leaves the ceasefire vulnerable and begs further questions. First, why isn’t the government willing to accept a bilateral arrangement right away? At one level, this stems from past failures. The only bilateral ceasefire signed by the FARC and the government dates back to 1983, under the presidency of Belisario Betancur (1982-86). Neither side ceased hostilities and it only exacerbated the deterioration of the peace process, which collapsed shortly thereafter. Under Andrés Pastrana (1998-2002), the FARC was granted a demilitarised area in which the peace process took place. But this allowed for the visible training and strengthening of the guerrillas, proving fatal to the negotiations in the end. The current negotiations could not produce either of these concessions Far from it: they were facilitated by the strength of the armed forces, which forced the guerrillas to come to an agreement with Santos in August 2012. And the government has no incentive to remove this military pressure, for fear of upsetting the balance upon which the peace process has rested. Moreover, the multiplicity of violent groups acting inside Colombia—including the ELN, the second largest guerrilla organisation, as well as a panoply of paramilitary, self-defence and vigilante groups and organised criminal bands—would make it very difficult for the government to implement a bilateral ceasefire. Finally, should the government reduce the steady military pressure on the guerrillas, political support for the negotiations—now approved only by a slim majority of the population and the governing coalition–would be severely shaken. Secondly, is the ceasefire likely to stand? There is scope for optimism, owing by and large to the positive record of past truces undertaken by the FARC and the Santos administration, during the Christmas and new year’s festivities of 2012 and 2013, as well as around the presidential elections in May and June last year. But a third and rather different question follows: what will happen if either party attacks the other? The straightforward answer is the ceasefire would collapse. But very different consequences would follow, depending on the perpetrator. A FARC breach would damage the credibility of its control over its armed apparatus and represent a political defeat for the guerrillas. Should the government take the first step, however, by virtue of the FARC’s conditions the deal would be no more, and Santos would have to confront the political consequences of an attack waged by the armed forces. In line with the president’s own promises, the armed forces has not ceased to operate against the guerrillas. On 31 December, they attacked FARC troops in Algeciras, a municipality in the Huila department, and captured Carlos Andrés Bustos (alias Ricardo), second in command of the Teófilo Forero columna. Interestingly, while the FARC condemned the operation, as with other alleged attacks by the armed forces, the ceasefire did not come to an abrupt halt. But then the Teófilo Forero unit has proved problematic for the FARC’s highest cadres for quite some time, so the kidnapping of one of its leaders could turn out to be beneficial in at least two ways. First, it would appear to be a contained blow against one of the guerrillas’ most troublesome divisions. Secondly, it leaves the FARC in a position to point the finger against the government’s military provocations as a major threat to its own ceasefire. Should the armed forces disrupt the truce the FARC could effectively shift the blame on to the government, making it bear responsibility for the missed opportunity for peace and the crisis that would ensue. This would strengthen the FARC’s position within the negotiations, boosting its image as the purported defender of peace, and bring more pressure on the Santos administration from the international community­—and, perhaps to a lesser extent, the Colombian public. But a failed ceasefire might not lead the entire peace process to collapse. Even if the truce between the FARC and the government were suddenly to break down, the peace talks in Havana would still likely progress, even if impaired, towards a final agreement between the two sides. In his last speech of 2014, Santos wished for the Colombian people that 2015 would be the year of peace. The ceasefire still holds but the path towards a definitive peace is still laden with risks. On 15 January Santos announced that he would be ordering the government’s delegation in Havana to begin discussing the possibility of a bilateral ceasefire with the FARC. The initial aversion towards a bilateral agreement that would entangle both the armed forces and the guerrillas appears already to have waned. But in some fundamental ways Colombia is already living under a virtual bilateral deal. The drastic reduction in clashes between the army and the FARC has brought an easing of hostilities unlike anything in the past 30 years. The relationship between the two sides has shifted from attempted mutual annihilation to mutual avoidance. For both actors, the benefits of a decrease in violent confrontations outweigh the costs of a breakdown of the current equilibrium. The FARC’s decision voluntarily to renounce operations against the armed forces poses a crucial test for Santos’ government as well as the guerrillas. It has shown the latter that violence may not be as useful as it may have been in the past. The FARC cannot hope to wage a successful war against the armed forces; indeed, nor can it hope to resort to violence again without suffering a catastrophic blow to the credibility and political capital accrued through the past two years of negotiations. Yet the ceasefire will leave the onus on Santos to make the next steps—and show the true extent of his willingness to negotiate a political way out of Colombia’s conflict.